Google Earth is a great mapping tool, hugely detailed and packed with features. Like Street View, for instance, which helps you navigate millions of miles of road all around the world, and would probably justify installing the program all on its own. If you don’t like the program, though -- or, maybe, you just don’t like Google -- then there are some excellent alternatives available. The open source and cross-platform Marble, for instance, can’t compete with the photos and the imagery of Google Earth, but is still extremely powerful and has a great deal to offer. The program is available in Windows, Linux, Mac and mobile editions (Nokia N9, N900, N950). We opted for the Windows build, and found Marble downloaded and installed quickly. 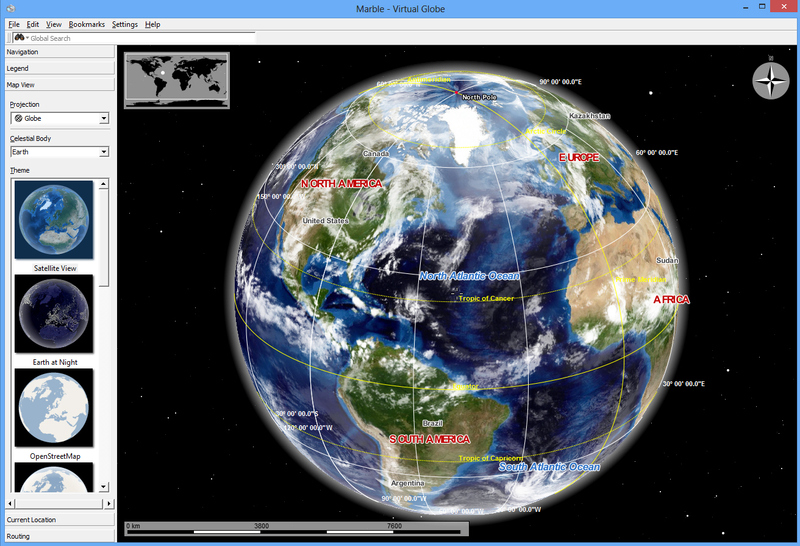 It opens Google Earth-style, with a view of the planet from space, and navigation is similar: left-click and drag to rotate the globe, spin the mouse wheel or double-click to zoom in. As you focus on a particular region, so cities and towns appear. Clicking any of these opens a panel with some basic data (elevation, population, time zone), while a second tab displays the Wikipedia page for that location. This opening view only takes you to a country level, which means you won’t get to see smaller towns or villages. That’s easily fixed, though: click OpenStreetMap in the left-hand Theme list and you’ll be able to drill right down to street level, with road numbers, names, and plenty of other details (parking, restaurants, theatres, hotels and more). There are also tools to search for places, measure the distance between two points, or create routes to help you find your way from one point to another. And if this isn’t enough, then there are a host of bonus maps you can use. There are historical world maps from various dates, for instance. You can view maps showing the Earth at night, or highlighting temperature, or rainfall. Or you might venture a little further, with maps of the moon, Mars, Venus, Jupiter, Saturn and more (the Maps page will show you what’s available). Marble may not be quite as polished as Google Earth, then, but when you consider their relative budgets that shouldn’t be a great surprise. The program is still a free software triumph, though, packed with features, great for educational use, and with plenty of maps and other addons to extend its abilities. They’re even working on iOS and Android versions, apparently. Bring it on.